How to rip and copy DVD to VLC on Mac OS X is an everlasting and hot issue in all relevant digital copy, video conversion forums and bulletins. Backing up DVD to VLC means that you can enjoy your favorite DVD videos on computer conveniently and can protect your physical DVD disc from scratching. That’s why many people choose to transfer DVD to VLC on Mac OS X. Here, this article will show you two methods to play DVD on VLC: Method one, rip DVD with VLC on Mac OS X; Method two, copy DVD to VLC with VLC Alternative on Mac OS X. Method one: How to rip DVD with VLC Media Player on Mac OS X? VLC is not just a media player. It allows you to rip your DVD as well. Here we will show you how to rip DVD movies with VLC. (Note : This tutorial is written for VLC 0.9.6 and up). Step 1: Go to http://www.videolan.org/vlc/ and download VLC media player for free for your operating system, then install it. Step 2: Insert the DVD you want to copy into your computer and open up VLC media player. Step 3: Select ‘File’ on the top menu, and select ‘Open Disc…’ from the drop down menu. Step 4: Select the Title you want to copy. On most movies this will simply be ‘1’, and if there are any special features they will be titles ‘2’, ‘3’, and so on. Usually with TV series on DVD ‘1’ will be the first episode, ‘2’ will be the second, etc. Put in the title number box the number you believe is the title you want to copy. At this point it’s a good idea to check that you’re going to rip the correct video file so go ahead and click ‘OK’ at the bottom and the correct Title should begin to play. If this isn’t the correct Title, then try a different number until you get the right one, once you have the correct title continue to the next step. Step 5: Check the box that says ‘Streaming/Saving:’ on the bottom left hand corner, at this point the ‘Settings…’ box should not be grayed out so click on it so we can fine tune the video and audio encoding settings. Step 6: Check the ‘File’ box at the top and then click Browse. Now you will need to select where you want to save the file and what you want to name it. Select a directory where you would like it to be saved. My Videos on a PC or your Movies folder on a Mac/Linux is a good place for now. Make sure that at the end of the name you add ‘.mov’ because VLC will not automatically add the file extension. Optional: For advanced users, if you are not planning on importing this into iTunes to use on an iPod you can select a different file extension such as .mpg, but just make sure that when you encode it you use the correct MPEG TS encapsulation method and mp4v or other corresponding transcoding option. Step 7: Now we need to select the encapsulation method. On a PC or Linux you need to select MOV and in OS X select QuickTime. Step 8: Check the box next to ‘Video’ in transcoding options. In the drop-down menu select ‘h264’ under the ‘Bitrate’ select ‘1024’ and under ‘Scale’ select 1. Step 9: Check the box next to ‘Audio’ in transcoding options. In the drop-down menu select ‘mp4a’ under the ‘Bitrate’ select ‘192’ and under the ‘Channels’ select 2. Step 10: Now click ‘OK’ at the bottom on the box and it will close. Click ‘OK’ again in the original box and the ripping will begin. Depending on the speed of your computer this can take anywhere from 15-40 minutes to import every half hour of video. Step 11: Import the video into iTunes by dragging it into the Movie section. you can now play the movie right in iTunes, enjoy! Using VLC to rip DVD on Mac OS X takes too much time. And you will notice the converted movie in lower quality compared to the original. Also, VLC does not support the DVD with internal encryption so that it can’t recognize protected DVD well and fail to extract movies from DVD successfully. In this case, you have to turn your eyes to VLC Alternative to solve the problem. Method two: How to copy DVD to VLC with VLC Alternative on Mac OS X? 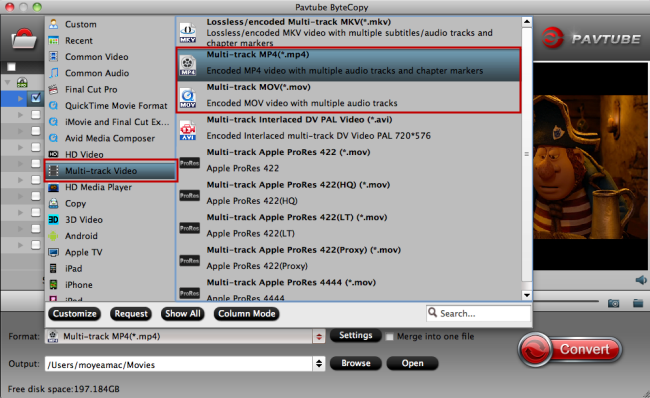 Pavtube ByteCopy for Mac is recommended as VLC Altenative, which can 1:1 backup DVD protected without lossless quality. It enables you to rip DVD to VLC on Mac OS X in H.265, M3U8, MP4, MKV, MOV, AVI, DivX, etc, at fast speed. Not like VLC, it continuously upgrades with new decryption technology for new released DVD. And it can support the newest Mac OS X system, like macOS Sierra, El Capitan, Yosemite 10.10/10.9. Click “File” in top left corner and follow “Load from disc” to load the DVD to VLC Alternative on Mac OS X. You can choose multi-track MP4 format for VLC, which can preserve multiple audio track and chapter markers. Click the format bar to follow “Multi-track Video” and “Multi-track MP4 (*.mp4)”. Tip : Click the “Settings” button to adjust multi-task settings. On the “Multi-task Settings” interface, you’re allowed to check your desired audio/subtitle track, and uncheck audio/subtitle tracks that you don’t want. Click the red button “Convert” on the main interface to start conversion from DVD to VLC. It will pop up a conversion window indicating the conversion progress from DVD to multi-track MP4. 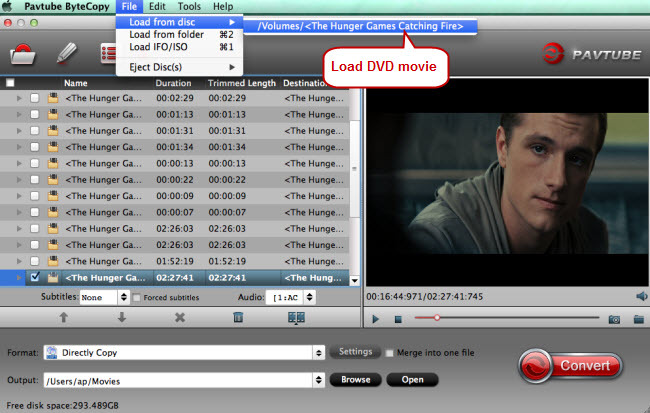 Both of the two method can achieve the process of DVD to VLC on Mac OS X. Nevertheless, the latter method obviously is easier than the former one. and it has much faster DVD ripping speed than DVD ripping with VLC. What’s the most important, ripping DVD to VLC on Mac OS X with VLC Alternative can reserve the original video quality. Now, you can smoothly enjoy DVD on VLC. How to play Region Code 1 and 2 DVD Without Changing DVD Region Codes? How to Rip Blu-ray DVD Movies with Forced Subtitle Tracks Preserved? How to convert Blu-ray/DVD ISO file to USB Type-C supported format?